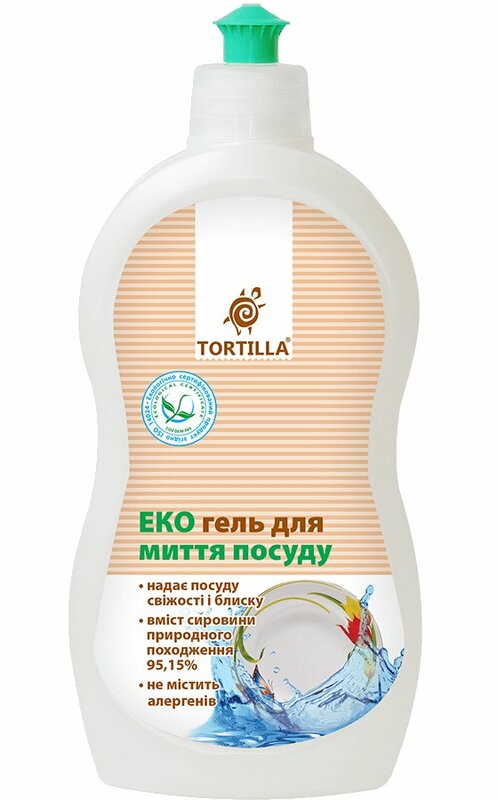 Ukrainian household brand TORTILLA presents ECO dishwashing liquid. This is an absolutely safe and highly effective product formulated with 95.15% of ingredients of natural origin. It is based on biodegradable surfactants which easily remove grease from different kinds of surfaces without damaging them. Allergen-free. ECO dishwashing liquid will make your dishes squeaky clean even in cold water. It removes grease and food residue without scratching the surface and helps to get rid of unpleasant smells. The product is easy to rinse off, it leaves no residue that might endanger your health. The product doesn’t contain any toxic ingredients that may harm the environment. Approved by the Ministry of Health of Ukraine. All TORILLA products are ISO 14024 compliant, which is confirmed by the Green Crane ecolabel on the packaging. Directions. Apply a small amount of product to a wet sponge or dissolve 5 ml product in 1 l water, wash the dishes, rinse thoroughly. Caution. Avoid swallowing and contact with eyes. In case of contact with eyes, rinse with plenty of water and consult a physician if necessary. Keep away from children and pets. Ingredients. Water; 5-15% Anionic Surfactants; <5% Amphoteric Surfactants, Non-Ionic Surfactants, Sodium Chloride, Complexing Agents, Parfum, Preservative. Want to buy ECO Dishwashing Liquid? Call us or submit your order via our web site!